Preshay Knight [center] moved from America to Kenya in 2015. 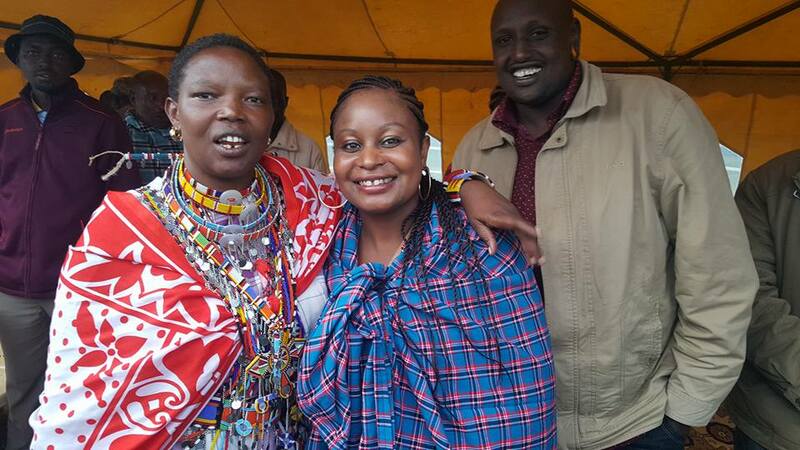 Above, she is pictured attending her first women’s empowerment Maasai fundraiser in Kenya. IMAGINE moving to Kenya and starting your own business selling cakes on the street! We chatted with African American Preshay Knight about how she did it... and, if you're ready to take the leap too, she can guide you through a similar African relocation path. Be sure to check out our podcast interview with Preshay at the end of this article! How did you end up moving to Kenya? I decided to move very abruptly because I was extremely sick at the time and I was suffering. I was contemplating suicide. The doctors had pumped me with so many drugs and I was starting to lose my mind. I knew if I didn’t do something drastic I would not survive. And then one day, I woke up and started doing research on relocating to Africa. Within a year and a half, I was in Kenya. I made up my mind that I was going to live and moving out of the United States was my only solution. How long have you been living in Kenya? And what area do you live in? I have been living in Kenya for almost three years. I live in Mombasa, Kenya. You made international headlines BY selling cakes on the streets of NYERI, Kenya! How did you end up doing that? LOL, you know, I’m from Compton, LA and I was born and raised up with a hustler's spirit. I saw a gap in the market and I decided to infiltrate the market. I was unemployed, had no money, and was ready to start a new life but had no means. So naturally, my hustle game kicked in. Here, when you walk into a supermarket or any bakery in general, you’ll often find their cakes are stale, old, and have too much sugar. It’s just not of good quality sometimes. The first day I started selling the cakes I sold 60 cakes in four hours. People were ecstatic to see a Black American woman hustling in the streets. They just had to try these cakes and they loved them. I had coconut, banana, and lemon. Soon, people started asking me if I could make birthday cakes. While hawking, I was offered an opportunity to work in a local bakery, so that was the end of selling cakes on the street. My biggest takeaway from that experience was some people would feel ashamed to do what I was doing—hawking in Kenya. But when your back is up against the wall and you’re hungry, and you want something bad enough, you would do whatever it takes to get it. And, you will not be ashamed of your hustle. I was beyond humbled and ready to claw my way into the new life I came for. 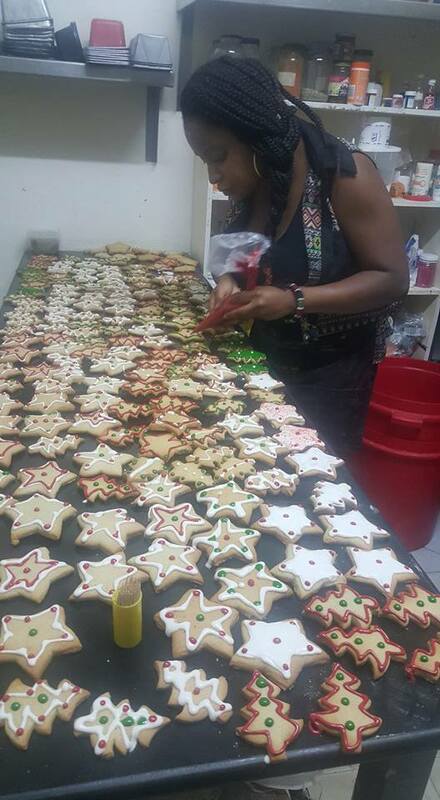 Preshay working on a last minute U.S. embassy order! Right now, my focus has been on Kenyan tourism. For the last year, I’ve been doing resort management, property management, vacation rentals, and vacation bookings. I’ve also taken up interest in buying and selling of land and properties. My ultimate goal is to become an immigration advocate for African American travel and migration to Africa. So, I’m currently in the process of building a website for my company, Wakanda Express Tours and Africa Immigration Consultants. You can learn more about my business on Facebook at: Wakanda Express. I’m also asking African Americans to send me their photos and video clips of their travels to Africa and experiences. A resort that Preshay worked at in Mombasa, Kenya. What types of business opportunities are there for foreign entrepreneurs? Business and career opportunities are available here for anyone with a dream, goal, or vision. What you find in Africa is that the majority of industries are lacking enough professionals with the experience and better standards of operation. Hospitality, customer service, medicine, education—all of these industries are in developmental stages across many parts of Africa. That leaves opportunities for those of us who have the experience to provide guidance. This can be done by opening up our own businesses and setting those higher standards. You could become a consultant in your field or get a job in a specific industry. No matter what you do you will find that your knowledge and experience equal opportunity and power. What advice would you give aspiring African diasporan entrepreneurs? Diversify your portfolio. Find the right African country you think is best for you. Then start doing your research on the industry you’re interested in and find gaps in the market. Bring solutions and a better quality of living. Research business registration processes. Find out how easy or challenging it is in a particular country to start a business or get a work permit. Don’t look at Asia, Europe, and America as the only place with investment opportunities. I will tell you right now—the entrepreneurs, investors, and those buying land and property are people from those countries. They are coming in droves to invest while Blacks around the world are thinking Africa has nothing to offer and is a shithole. So you better get in now before they take it all for themselves. What’s everyday life like for you in Kenya? There is a freedom and beauty in Kenya that surrounds me every day. I don’t know how to explain it. Now, I face big and small challenges each day. But despite how hard it gets sometimes, I still find myself loving it here and not wanting to go anywhere else. Your mother is African American and your father is Kenyan. How are you viewed in Kenya—as an American or Kenyan? The Kenyan people accept me as a Kenyan because my father is a Kenyan. But from a government standpoint, I am not recognized as a Kenyan just yet. This is because I was over the age of 18 when I tried to apply for citizenship through my father. So immigration has become quite a challenge and the process takes time like everything else here. Do you speak any local languages? I don’t speak the local languages too well. But everyone says that I’m improving. I'm finding it very difficult to learn Swahili… but the longer I'm here, I'm sure I will slowly catch on. What are the most challenging aspects of living in Kenya? My income is not consistent. This means I could end up in a bad situation easily. It is expensive to get a work permit. So because I came to Africa with nothing I am starting from the bottom with everything. Another challenge I'm faced with is people trying to steal money from me in some fashion. I also find it very challenging to watch below working-class Africans and so many others struggle to make peanuts every day. Some make $3 a day for 12 hours of work. I don’t like seeing people suffer. Sometimes I struggle in my mind with certain things that I cant control, fix, or make better for Africans. Can you share a few details on the cost of living in your community? The cost of living depends on where you live in Kenya. However, in general, life is very affordable for me. When I first moved to Nairobi from the States I was able to get a brand new two bedroom apartment for $227 a month. My electricity bill is typically $40 a month. And my water bill is around $9 a month. Depending on the service provider, the Internet can get very expensive. You can easily pay up to $50 or $60 a month and yet the quality and service may not be good. An Indian Ocean beach near Preshay's home in Mombasa, Kenya. Would you encourage an African diasporan to consider moving to Kenya? What surprises me is it doesn’t come naturally to African Americans to want to experience Africa. However, now we should know the truth about Africa and that it’s not all bad. I would highly encourage every African American to experience the Motherland and its greatness. Whether it's for travel, investment, or relocation, regardless of the experience you will come out of it transformed and awakened to who you are as a Black man or woman on this planet. What advice would you give to a new visitor or expat to Kenya? If you’re a new visitor in Kenya, be patient and understand that it is a third world country. Things do not operate as efficiently as they do in the States. There are bad roads, bad customer service, and sometimes bad leadership, just to name a few. It happens to all of us, but do your best to be vigilant about not getting taken advantage of and ripped off for money. Use people like myself and other African Americans to guide you on your journey. You’ll be surprised how big our presence is in Africa. And we’re willing to help because we want to see everybody succeed in their journey and transformation. And last but not least, find your peace and freedom. What has your time living in Kenya taught you? How has it changed you? I live a better quality of life. I have my health and peace of mind that I’m where I’m supposed to be. And, I have my freedom. I found all of that when I moved to Kenya and with time I’ve understood that these things are the most important in my life. I have also changed and grown in so many ways. I realized that I spent my whole life taking everything for granted because I’ve always had so many material things. Now, I almost have nothing and yet I feel rich within myself. Compared to many other African Americans, I would be considered a poverty case. I’m not financially stable yet, but I am in the process of finding myself. I’m changing into a woman that can be financially stable and do what I have always wanted to do. This is a part of my journey.